The temporary roundabout at Los Robles, Catalina and El Camino del Mar. Catalina Street resident Joan Cernich knows first-hand how a temporary roundabout the city installed at a five point intersection has slowed traffic. Prior to its installationat Los Robles, Catalina, and El Camino Del Mar streets, collisions occurred twice in her front yard. She said none have occurred since cars started braking to maneuver around the circular painted island at the intersection. 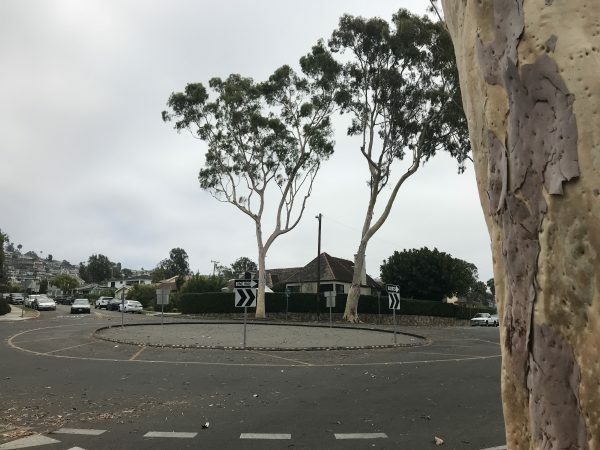 This week, Cernich expressed her support for the city’s plan to make the installation permanent, though she thinks arborists should inspect the soundness of six towering eucalyptus trees on the parkways that border the intersection. Two were previously removed. She thinks they are a danger and cited the eucalyptus that fell across Broadway Street earlier this month. This week, City Council voted unanimously to support a $300,000 plan to beautify the central roundabout. The temporary version, consisting of pavement markings, signage and rubber curbing, was approved in April 2014 at a cost of about $30,000. A concept plan, based on input from a public workshop and the City’s Enhanced Mobility and Complete Streets Transition Plan, was developed to improve the center median island, surrounding parkways and pedestrian crossings. Similar roundabouts are in use five Orange County cities including San Clemente. Ann Wiese agrees that the neighborhood has benefited from the roundabout. She lives three houses off the intersection and attended the public workshop last December. She said most workshop participants wanted crosswalks and preservation of the eucalyptus trees. The $100,000 concept planby San Diego-based Van Dyke Landscape architects received the approval of the Design Review Board in March. 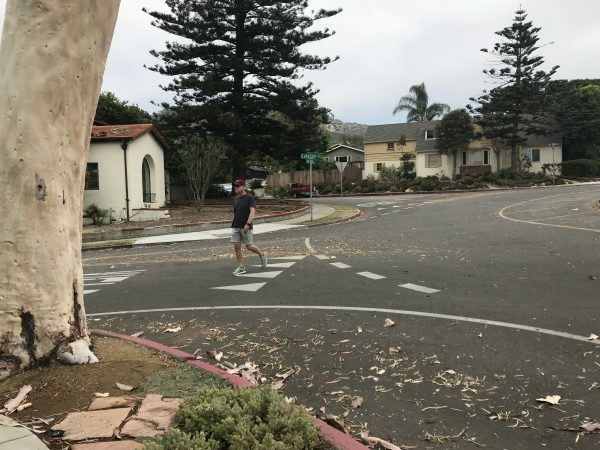 It included access ramps compliant with the Americans with Disabilities Act and crosswalks at the four streets, decorative pavers and boulders, cobblestones, 10 types of drought tolerant plants and seven coast live oaks. Sharrows serve to alert motorists to cyclists and pedestrians as there are no crosswalks at the intersection. Photos by Donna Furey. The concept plan has since been amended, said Shohreh Dupuis, the assistant city manager and public works director. The six existing eucalyptus would remain and just one oak would be planted and down-lit as the centerpiece of the roundabout, she said. City staff estimated the project installation cost at $750,000, but council ultimately voted for a scaled-down version that cut costs by $300,000 by eliminating parkway landscaping, irrigation, crosswalks, curb ramps and other sidewalk and pavement modifications. The staff report said that if pedestrian improvements were added to the roundabout in the future, they would require reconstruction of a significant portion of the center median due to grade changes needed to meet ADA requirements. Project manager Tom Sandefur explained that the project significantly exceeded the budget and said that there had been no “reported issues” at the intersection. Council member Bob Whalen questioned making center median improvements that would have to be re-done if crosswalks were installed in future. Sandefur said the scaled down project would be permissible because it leaves pedestrian use untouched. Two residents spoke in favor of the smaller project. Chris Reed, who lives nearby, said he was unaware of pedestrian issues and appreciated the parkway eucalyptus trees. Michael Morris called the price tag for the larger project “exorbitant” and “shocking.” He said the intersection “doesn’t need lighting” and added that he thought it would be fiscally prudent to keep within the original budget. Council member Toni Iseman asked if parking spaces displaced by the temporary roundabout would be regained with a smaller scale project. Sandefur said none of the 11 or 12 spots would be regained under either plan. Council members Steve Dicterow, Rob Zur Schmiede and Mayor Kelly Boyd expressed support for the simpler plan. City Manager John Pietig said the project may need another review by the Design Review Board. In a staff report from 20 August 2013 the city reveals plans for building roundabouts at three locations along Glenneyre. A roundabout test location was chosen at Glenneyre and Cress streets but defeated by council vote and relocated to Catalina and Los Robles. A 2002 study by Ostterson and Associates for LBC shows a roundabout design concept for Catalina and Los Robles that excludes all mobility modes but automobiles. Priced at $135,00, they concluded the only reason for locating a roundabout here was for improving aesthetics. The city engineer concluded the low accident rate does not warrant the change. Ill conceived, wrong location, wrong functionality, uber priced at $750,000. Move this design to Calliope and Glenneyre where it belongs. Les I could not agree with you more! This was nothing more than a test roundabout in a place where no solution was needed. But innocuous enough so Council could gather” insights” before committing to a place that actually needs it.